Click on a photograph to enlarge it, or on a blue hyperlink of interest. * In each of these views of Holding Street, Beaumaris, looking west from Dalgetty Road, there are private houses with fences on both sides of the street, but those in the1966 photograph are screened from obvious view by the roadside vegetation. See also nearby High Street, which crosses Holding Street at the far end of this view. 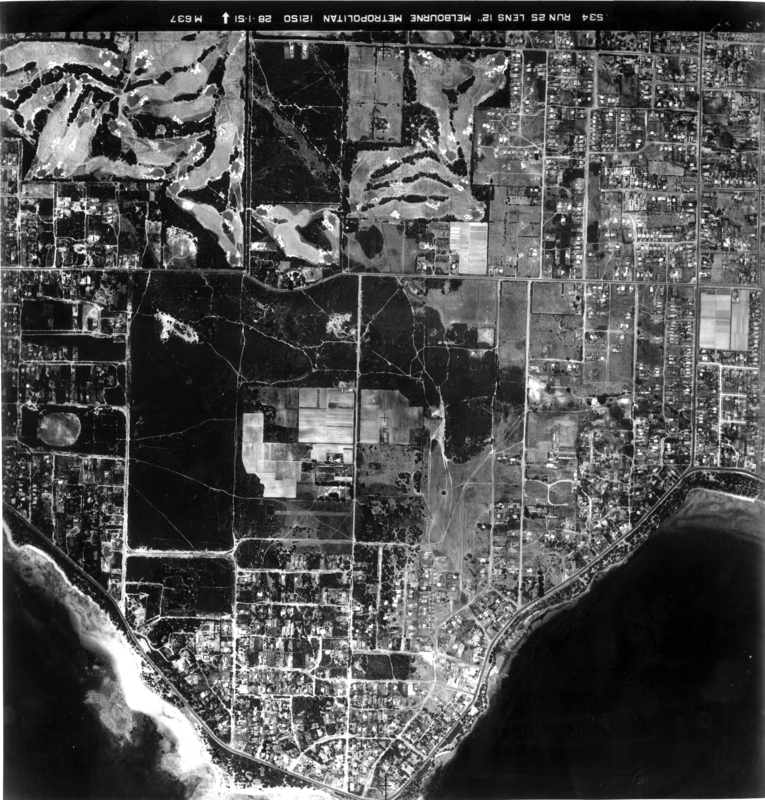 * Aerial views of this part of Beaumaris can be zoomed into from a high resolution aerial photograph taken in January 1951. They show the route, via Holding Street, of the electric tramway that operated for 5 years from 1926. A plan of the route is shown on Page 14 of a promotional brochure for the Deauville Estate. 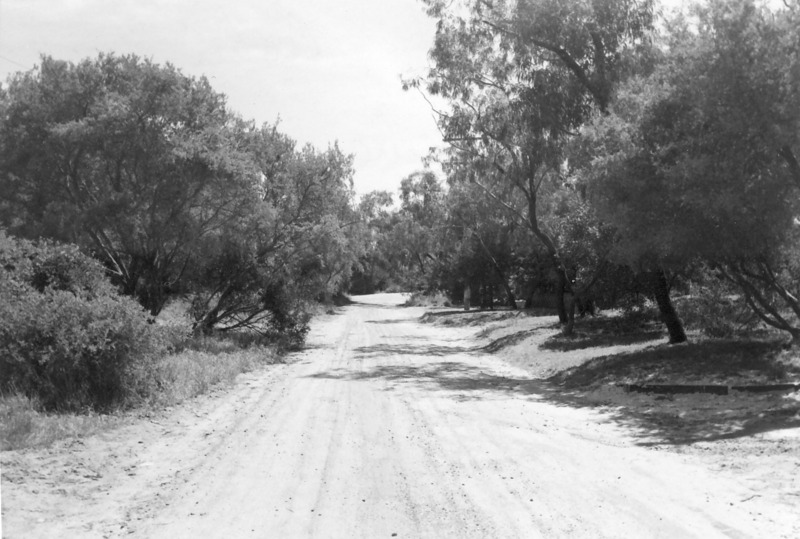 The 1966 photograph shows remnants of the bitumen road and the gaps, where the rails for the tramline built 40 years previously were later removed, were still evident at the time the photograph was taken. 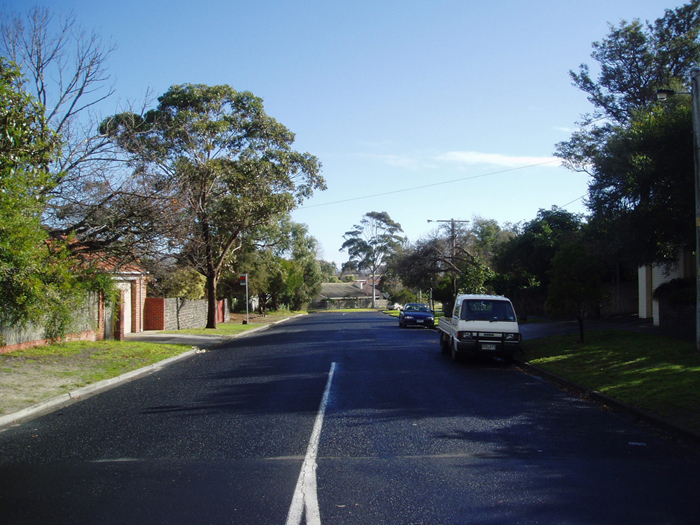 * See, from an eastward-looking perspective, the remnant of the treed Holding Street Road Reserve that is visible in the distance at the left of the July 2007 photograph above, and that was saved from sale by Bayside City Council in 2004.